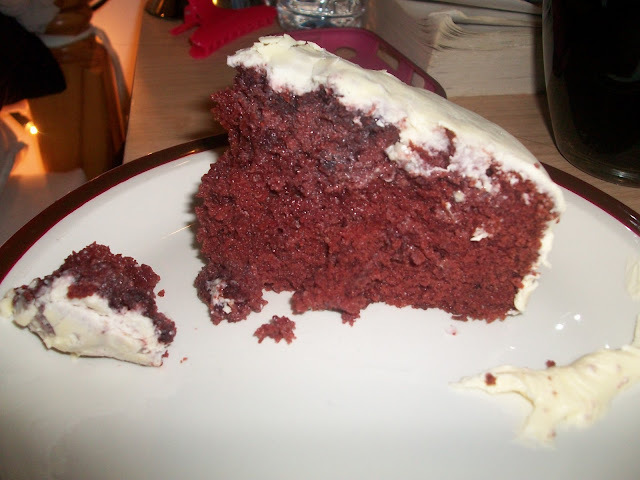 Emilicia STYLE - A Beauty, Fashion, & Lifestyle Blog: Betty Crocker Red Velvet Cake: Recipe And Review! 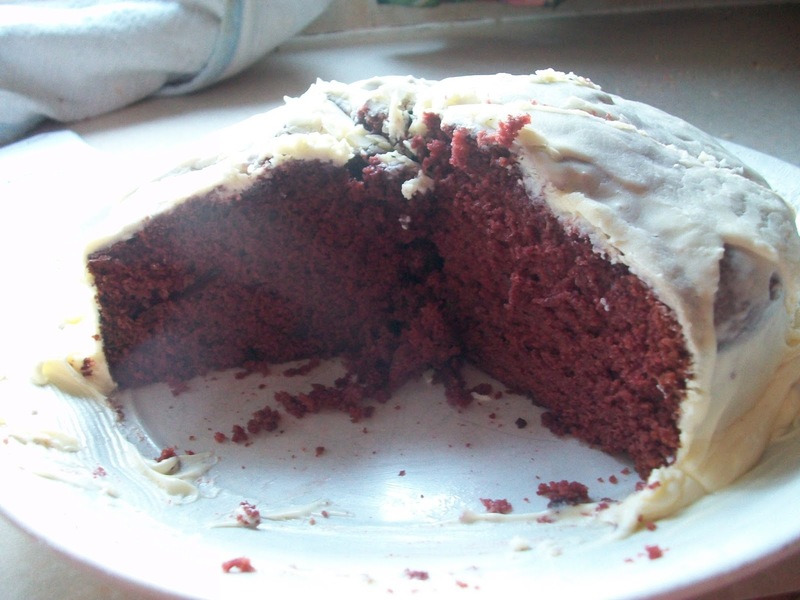 I'm stuck in bed ill today with a sore throat, throbbing headache and swollen glands (I know, lovely) but nevertheless, I'm soldiering on scheduling this new blog post for you all - my review and the recipe for this gorgeous Red Velvet cake! I decided to make this cake after seeing the cake mix box in Tesco for only £2.25 - I'd wanted to make my own cake for ages, in fact, I've wanted to start baking things in general for a long time and just never got round to it, but on Friday I finally did it - and this was the result I got! Technically, I know this isn't making my own cake from scratch, so to speak. But, being someone who can't cook to save their life, this is a big step for me! Especially since I never learned much from cookery lessons in school, and the fact I was always too scared to use an oven... it's only recently I even figured out how to use one properly, and a stove (shocking)! But, overall, I'm really happy with how this cake turned out. It didn't end in disaster, I didn't burn anything (though I did have the help of my mum and brother) and it was really easy to make! 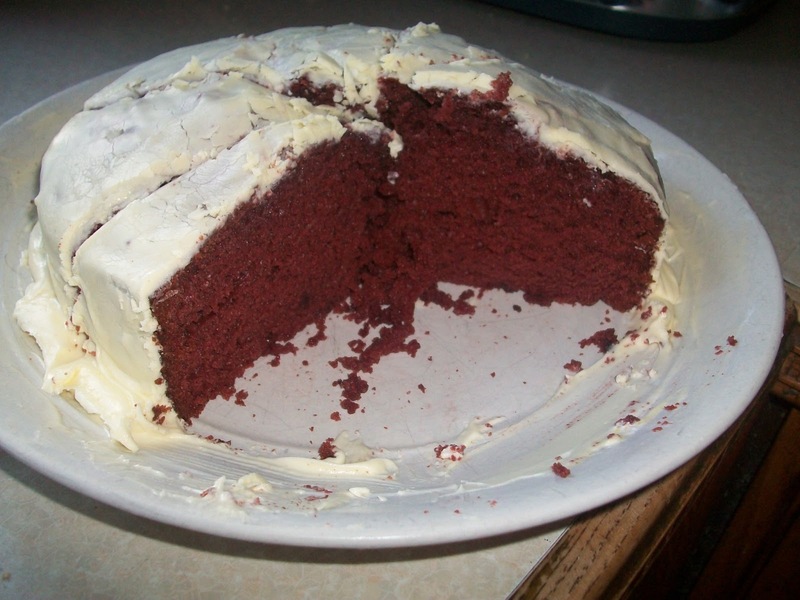 I'd never tried a proper red velvet cake before, either.. I've always thought they looked amazingly nice, and I have tried a red velvet Krispy Kreme doughnut, but this definitely didn't fail to impress! Mix the eggs, oil, water and cake mix together in the mixing bowl and whisk by hand or with an electric mixer. 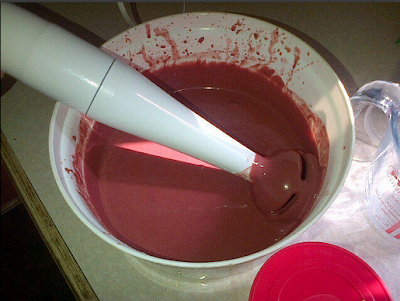 I used an electric mixer for around 2-3 minutes and until smooth and creamy (like right). 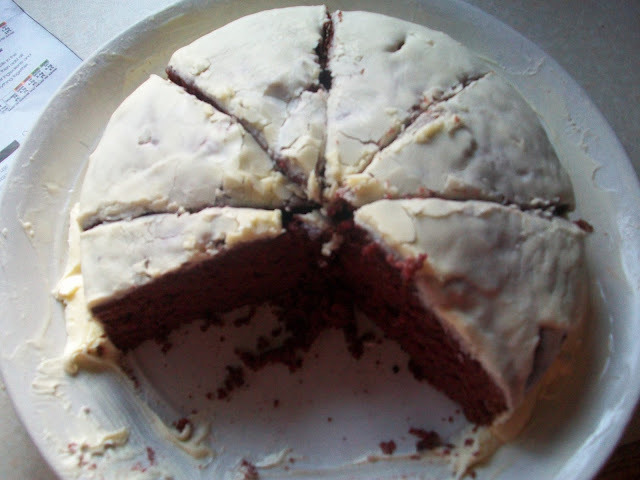 Pour the mixture evenly into your two (or one) greased cake tins. Bake in the centre shelf of the oven for around 23-28 minutes if you're using two cake tins. If you're using one like I did, however, you'll need to leave it longer, and I had to leave mine in for about 45 minutes. If you used 2 cake tins, sandwich the cakes together with a layer of Betty Crocker Vanilla or Cream Cheese Icing. Once they've been sandwiched, or if you used just one cake tin, cover the entire cake (sides and top) with more of the icing.. Make sure it's at room temperature first, and before putting on your cake, stir the icing with a rounded knife. Ok, so it doesn't look exactly as tidy as it looks on the box, but who cares, it tasted good! It really did taste incredible once done - I was already licking the icing off the bowl and utensils before I even tried a slice of the cake, but I couldn't help myself, it was too good! I would highly recommend this mix to anyone - preparation took as little as 10 minutes, and it's even less time if you're using 2 cake tins instead of one. The sponge was delicious and cream cheese frosting made it even better. 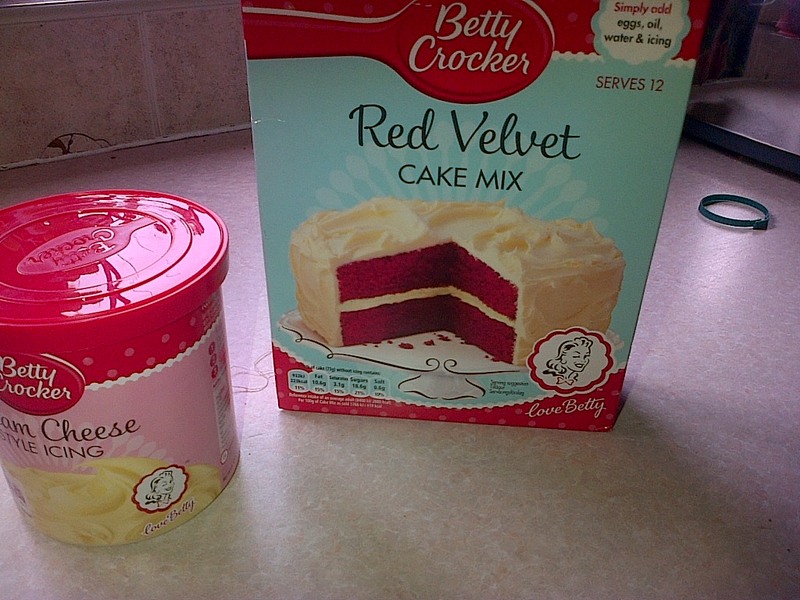 It's official - red velvet has got me hooked! It serves up to 12, too, so with my family of 7, there was more than plenty to go around. And, they all said it was delicious - so not only do you have my word on it, you have theirs too! Oh, and lastly, I know this isn't really supposed to be a 'baking blog' - but, doing this has really made me wish I had one, and it might be something I'll have to consider - that and the reason I love cake! 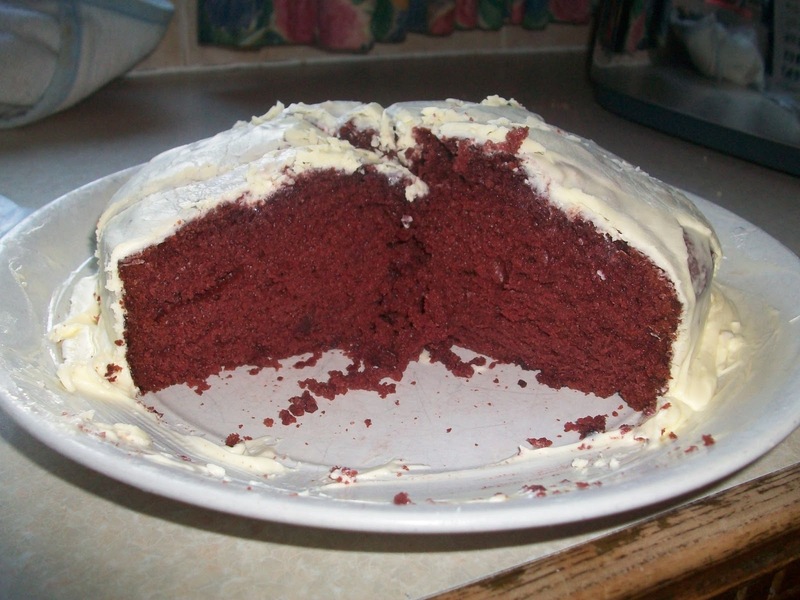 Have you tried red velvet cake or had a go at making your own? Let me know in the comments - and have a great week! Aww your cake really looks yummy and delicious! I have to try this cause I love red velvet cakes! I definitely will try it more though - we need to make one together!! Aww, thank you so much for this nice comment! You're always so lovely and I appreciate it a lot! I think I'm getting a little better now, but still not well :-( hopefully I'll recover soon! Hahaha, woops! Sorry about that! I know how you feel though, every time I see these photos I wish I had some more of it to eat..
Favourite-wise, it's a carrot cake, profiteroles or chocolate torte depending what mood I am in. Oo, why is it your suspicious of the ingredients? Do they usually contain something bad? Mine seemed ok but yeah, you're probably better off doing everything from scratch yourself! Those are good picks - I love profiteroles, and anything chocolate, too! 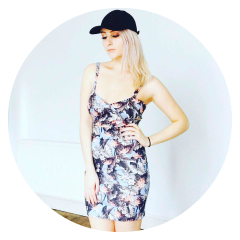 I'll definitely come and check out the giveaway on your blog - thanks for commenting and have a great day!